Beautiful, large sinks; just didn't work in my space. Dimensions 21.88 In. X 21.88 In. X 4.0 In. Bought this sink as a combination package with the faucet. The sink in and of itself is great, but mounting the sink was challenging. Unlike round vessel sinks which come with a mounting ring, Kraus provides no mounting support hardware with this sink. When we called them, they suggested using another rubber drain washer between the sink and the counter. Without some type of mounting pad, the sink will wobble and rotate. My fix was to CNC machine a 4" x 5" mounting base that would match the exact profile of the bottom surface of the sink. My base also had a rubber pad that fits between the sink and the base, and an o-ring which fits between the base and the counter. My base functions exactly like Kraus's circular mounting rings for the round vessel sinks, it is just rectangular and machined to match this sink. Once installed, the sink was rock solid and well supported. I made extra in case I screwed one up, so anyone who wants one can find it on ***** under Los Angeles with the title of Kraus Rectangular Sink Base. Overstock may delete this post since I am mentioning ***** , but this machined base was the only way to really mount this rectangular sink with a professional look and I figure if someone wants to use my leftover pieces, what is the harm. I just received this sink and can't wait to install it in new bathroom. It is beautiful! This sink is beautiful. It looks great on the granite counter top. I would highly recommend this sink to anyone. Love the color! This sink is just beautiful and is exactly the right touch that I wanted for my master bathroom. I would highly recommend it. I love this sink, and will be using it in the half bath. It is unusual and will be the focal point of this bath! I couldn't be happier with this interesting and artistic bathroom vessel. 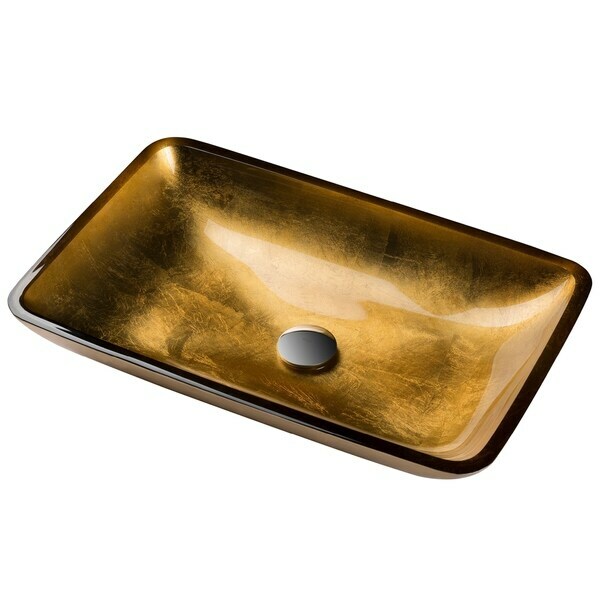 I have now purchased 6 Kraus sinks through Overstock and this one was just a gorgeous as the rest. They all have that "wow" factor that as a designer I am looking for and pricing can't be better. This sink was for a builder who has abandoned his current supplier to only purchasing sinks and faucets from Overstock, thanks for making me look good! This gold glass sink arrived quickly and safely. Too bad it was not right for our new home. I really wanted to make it work! This is a sink that could be a holy shrine it's so beautiful. Not tacky, just sumptuous against a dark-colored porcelain tile countertop. The first glass sink I purchased was so ugly I tried sanding off the paint on the backside, ended up throwing it out. But second purchase was a real prize. This was our first Overstock.com purchase and being honest, we were very skeptical. Well, what a wonderful surprise when our sink arrived in absolutely perfect condition and even more beautiful than the picture showed. The quality of this sink is excellent. Customer service was extremely helpful in explaining international costs associated with this purchase. Shipment was much quicker than expected too!!! Needless to say, our first purchase was not our last. GREAT PRICE, GREAT VALUE, GREAT SERVICE. The sink is awesome and beautiful!!! I ove it! Beautiful sink... well built.... but it doesn't fit our vanity at all. Sadly. I absolutely loved it! It looked even better than I expected. The quality is amazing and seems very durable. I was very impressed with the price and even better the discount coupon that I received. "If this does not come with a mounting ring then what do you suggest we use?" You may use a mounting ring like ITEM#: 11747356. "what does PU mean? do you need to buy one of the stoppers? I'm confused"
PU stands for pop up drain. You can choose to purchase this sink without the drain, or you can choose to purchase with the drain in the finish of your choosing. You can choose which option you'd like from the drop down options menu. "Hi there Is the vessel sink compatible with the Australian plumbing? If not, what is the difference?" Hello Miecia, yes this sink is compatible with Australian plumbing. Have a great day! "Can i just check- are the plumbing pipesto connct waste and taps (faucets) compatable with british (UK) plumbing??" Hello Helena, unfortunately, this would not be compatible. Thank you for shopping with us! "Can this be wall mounted with no base?" No, vessel sinks cannot be wall mounted. "Do you recommend a base to keep it stable?" You do not need a base to keep this sink stable. You can add a base for extra stability if you like, but doing so is not necessary.